These minute wasps parasitize the eggs of many different insects, particularly Lepidoptera. As early as 1912, trichogrammatid wasps were used as a biological control agent against codling moth. However, even where parasitism rates have reached 50% or more, reduction in fruit damage has not been significant or consistent. In warm growing areas of the Northwest, the common species are Trichogramma minutum and T. praetiosum. T. minutum are notoriously indiscriminate in their choice of host eggs and have often been seen trying to lay eggs in specks of dust or other inanimate objects about the same size as host eggs. However, Trichogramma species are known to produce locally adapted strains, which may have narrow host ranges. The degree of host specialization of species in Northwest orchards is unknown. The egg is deposited into the egg of its host. The larva and pupa develop inside the host egg. The adult is a yellow wasp with red eyes and is 1/25 inch (1 mm long) or smaller. Trichogramma overwinter as pupae inside host eggs in leaf litter either in or outside the orchard. Low parasitoid activity early in the growing season suggests that they most often overwinter on a non-pest host outside the orchard and move into orchards again in May and June. The female deposits one or more eggs into the egg of its host. The wasp larva hatches and develops inside the host egg, consuming its contents. 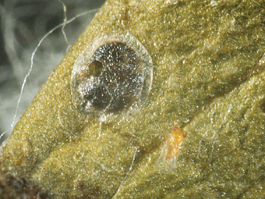 The pupa is also contained within the host egg. The host egg turns black when the pupa is nearly ready to emerge as an adult. The larva transforms into a pupa, then into an adult wasp, which leaves the remains of the host egg and mates. The species found in the Pacific Northwest produce 6 to 10 generations a year. The best way to determine if Trichogrammatid wasps are in the orchard is to collect codling moth eggs during midsummer and late summer moth flights and examine them. However, the eggs, which are laid singly on leaves or fruits, are extremely difficult to find. Parasitized eggs will turn black, and the microscopic wasps will later emerge. 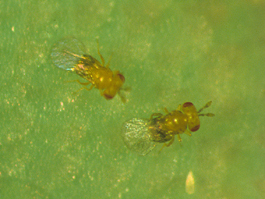 Trichogramma wasps are sensitive to most commonly used pesticides. Even botanical pesticides such as pyrethrum and rotenone are harmful to them. Studies in Europe and the former Soviet Union have shown that some species of Trichogramma gave better control of codling moth and leafrollers than T. minutum. In these studies, large numbers of wasps, roughly 10,000 per tree per season, were needed to reduce codling moth or leafroller damage by 60%. Although alone Trichogramma wasps may not be able to suppress fruit damage to acceptable levels, they can contribute to biological control of orchard pests and should be conserved where possible. T. minutum eggs can be bought from commercial suppliers for release in orchards. However, keep in mind that large numbers will be needed and, even if parasitism rates are high, alone they are unlikely to suppress fruit damage by codling moth below commercially accepted standards.